Congrats to Dave Peterson of Swedish Hill and to all the winners! New Paltz , New York , AUGUST 20—Swedish Hill Winery from the Finger Lakes won the coveted “Governor’s Cup” trophy at the 2008 New York Wine & Food Classic competition, held on August 19 & 20 at the Mohonk Mountain House in New Paltz, NY. The “Winery of the Year” award also went to Swedish Hill Winery. The elegant Governor’s Cup, a large silver chalice, recognizes the “Best of Show” or top prize of all 775 entries in the Classic, known as “The Oscars” of New York wine. The “Winery of the Year” award is presented to the winery with the best overall showing based on the level and number of awards in relation to entries. This year’s competition included 775 New York wines from the Long Island, Hudson Valley , Finger Lakes, Niagara Escarpment, Lake Erie, and other regions of New York State . The 2007 Vidal Blanc was also voted Best White Wine, and Best Vidal Blanc on its way to the ultimate award. Swedish Hill Winery received 2 Double Gold, 2 Gold, 11 Silver, and 7 Bronze awards on its way to that honor. A new “Specialty Wine Champion” award was added this year to recognize consistent quality among the increasing number of wines made from fruits other than grapes, or honey. The 2008 winner was Earle Estates Meadery, with 1 Gold, 2 Silver, and 5 Bronze awards. The awards were based on blind tastings by 25 expert judges—7 from California , 11 from New York , and 7 from other states. Judges included prominent wine writers, restaurateurs, retailers, and wine educators. Four-judge panels determined the initial awards, with top-scoring wines evaluated by all 25 judges for Best of Category and Governor’s Cup awards. Celebrating its 23rd year, the Classic is organized by Teresa Knapp of the New York Wine & Grape Foundation, and is open to all 242 New York wineries from all regions. In 2008, a total of 14 Double Gold, 62 Gold, 198 Silver, and 266 Bronze medals were awarded. In addition, “Best of Category” and “Best of Class” designations were awarded to wines rated as the finest in various areas. Double Gold medals require unanimity among a panel’s judges that a wine deserves a Gold medal, whereas Gold medals require a majority vote. The “Best of Category” awards, all eligible for the Governor’s Cup, went to Swedish Hill Winery NV Spumante Blush for Best Sparkling wine, Swedish Hill Winery 2007 Vidal Blanc for Best White wine, Anthony Road Wine Company 2007 Dry Rosé for Best Blush or Rosé wine, Bedell Cellars 2006 Musée for Best Red wine, Earle Estates Meadery Creamy Apricot for Best Specialty wine, and Casa Larga Vineyards 2005 Fiori Vidal Ice Wine for Best Dessert wine. The “Best of Class” awards for different varietals or proprietary blends, which were tasted off for “Best of Category” awards, went to Swedish Hill Vineyards Spumante Blush wine for Best Native Sparkling wine, Lakewood Vineyards 2007 Dry Riesling for Best Dry Riesling wine, Hosmer 2007 Riesling for Best Semi-Dry Riesling wine, Paumanok Vineyards 2007 Semi-Dry Riesling for Best Semi-Sweet Riesling, Castello di Borghese Vineyard 2006 Chardonnay for Best Chardonnay wine, Macari Vineyards & Winery 2007 Sauvignon Blanc, Katharine’s Field for Best Sauvignon Blanc, McGregor Vineyard 2007 Rkatsiteli-Sereksiya,Estate Grown for Best White Vinifera Blend, Whitecliff Vineyards 2007 Traminette for Best Traminette, Swedish Hill Winery 2007 Vidal Blanc for Best Vidal Blanc, Rooster Hill Vineyards 2007 Silver Pencil for Best White Hybrid Blend, Arbor Hill Grapery 2007 Vergennes for Best Other Native White Varietal, Hickory Hollow Wine Cellars Liquid Wisdom for Best Niagara, Anthony Road Wine Company 2007 Dry Rosé for Best Blush or Rosé, Torrey Ridge Winery Blue Sapphire for Best Concord, Barrington Cellars Baco Noir for Best Baco Noir, Swedish Hill Winery Viking Red for Best Red Hybrid Blend, Red Newt Cellars 2005 Cabernet Franc for Best Cabernet Franc, Osprey’s Dominion 2005 Reserve Merlot for Best Merlot, Chateau Lafayette Reneau 2004 Cabernet Sauvignon, Estate Bottled for Best Cabernet Sauvignon, Bedell Cellars 2006 Musée for Best Red Vinifera Blend, Earle Estates Meadery Creamy Apricot for Best Mead, Heron Hill Winery 2006 Late Harvest Vidal Blanc for Best Late Harvest wine, and Casa Larga Vineyards 2005 Fiori Vidal Ice Wine for Best Ice Wine. Complete results of the 2008 Classic will soon be posted under “New York Gold” at www.newyorkwines.org, which also includes Gold medal New York wines from other major competitions. 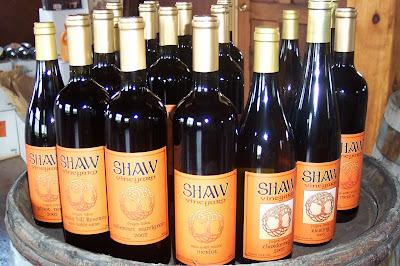 One of the most fascinating finds of my trip to the Finger Lakes was Shaw Vineyard. I tried all their wines, and found them wonderful. I was so impressed I looked up their reviews on the internet and then contacted one of their owners. "I had given high praise to the red wines at Shaw Vineyard when the new winery opened last summer. Little did I know that owner Steve Shaw and winemaker Morten Hallgren (who is also owner of Ravines Wine Cellars on Keuka Lake) were also working on a line of white wines," wrote the Finger Lakes Weekend Wino in his review of Shaw Vineyard. "I visited Shaw Vineyards last weekend as they unveiled these new whites and they are very impressive. Don’t let the slightly disheveled look of the winery's finishing touches being completed keep you away because, when you get past the rough exterior, inside you will find truly inspired wines." High praise indeed. You can read Finger Lakes Weekend Wino's reviews below. Shaw Vineyard is something special. "Shaw Vineyard was established in 1980 when my father planted Chardonnay and Cabernet Sauvignon on the east side of Keuka lake. Additional vineyards in Penn Yan, NY & Himrod, NY were purchased in the mid 1990's. We currently have 55 acres under vine between Keuka & Seneca Lake," Steve Shaw recently told me. Steve is no stranger to the wine business. His family has been active in the wine business for two generations. "I've been in the wine & spirits industry for 20 yrs now, and my father 30 years. He has been a grape grower for the following wineries for decades- Herman J Weimer, Dr Frank, Glenora, and Canandaigua Wine Co."
The accomplished and serious winemaker Morten Hallgren is Steve's secret weapon here. If you are serious about making serious wine, few people are as passionate as Mr. Hallgren. "My father met Morten when Morten was a winemaker at Dr Frank. My father was selling his grapes to Dr Frank then. Morten recognized the quality of my father's grapes and a relationship was established from there." Shaw Vineyard has some special wines. 2005 Semi-Dry Riesling is an elegant white with citrus and honey. 2002 Finger Lakes Cabernet Sauvignon is a deep red. An elegant red with big flavors, soft tannins, and a dry finnish. Very nice. Keuka Hill Reserve is a meritage of Merlot, Cabernet Franc and Cabernet Sauvignon.This is a nice, big wine, with big tannins and lots of beautiful structure. This meritage just recieved a rave review and an 84 from Wine Enthusiast! A well deserved score. In truth, one of the wines I was most taken with was LiBella Pinot Grigio. LiBella is a label one finds at Shaw. The Pinot Grigio is a light, fruit forward white with a nice lemon-y finish. A truly wonderful white wine. According to Steve, "LiBella is a second label for Shaw - a second label establishes its own brand identity. The Shaw Vineyard label to me is a very refined and mature label for an experienced wine drinker. My goal with LiBella is for a relaxed yet high quality Pinot Grigio that appeals to premium as well as novice wine consumers. The dragonfly on the label is meant to attract people based on the design. [The Pinot Grigio] has a refreshing summery feel in my opinion." It does indeed. I drank the LiBella and thought instantly of having an arugala salad with lemon and olive oil dressing with shaved parmesea, for example, with plenty of fresh Italian bread. The tasting room opened June 7, 2007. And Steve's goal is "to be recognized as a premium Finger Lakes wine producer and be included in the prestigious ranks with Dr Frank and Herman Weimer." The winery currently produces 3,000 this year. But Steve and his father hope to grow the winery to within 5,000 cases in a few years. Wine growers group picks the top producers in N.J. The Garden State Wine Growers Association announced the winners of its annual wine competition for wines made in New Jersey, the fifth largest producer of wine in the nation. The Winery of the Year Award went to Alba Vineyards of Finesville, which received a gold rating for three of its wines, silver for five and bronze for five more. The wines are rated by wine industry experts using the 20-point University of California/Davis system using clarity, color, bouquet, acidity, sweetness, body, flavor, bitterness, astringency and overall quality as criteria. Tomasello Winery in Hammonton won the Governor's Cup and the award for Best Dessert Wine with its 2007 Vidal Ice Wine. 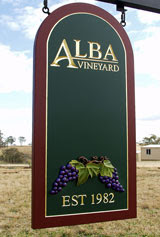 Alba Vineyards won the Governor's Cup for Fruit Wine and the award for Best Fruit Wine with its Apple Ice Wine. Heritage Vineyards of Richwood won the Governor's Cup for Grape Wine with its 2005 Chambourcin. 4JB's Orchards and Vineyards of Colts Neck won the awards for Best Hybrid Wine and Best Estate Wine with its 2004 Chambourcin. Plagido's Winery in Hammonton won the award for Best American Wine with its Antonio Rosso Fredonia. Coda Rossa of Franklinville wins the award for Best Vinifera with its 2006 Super Tuscan. Each of the award winners received a gold rating. Westfall Winery of Montague, 2006 Shiraz. NEWPORT, R.I. (WPRI) - The Ocean State was both well represented and well received at this year's Annual Atlantic Seaboard Wine Competition, where Newport Vineyards, a family owned Rhode Island winery, made quite the showing. The Fourth Annual Atlantic Seaboard Wine Competition was held on July 19-20 in Haymarket, Virginia, and included 458 wine entries from 100 wineries in 12 states. 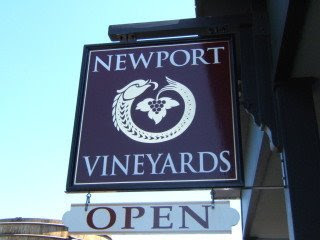 Newport Vineyards was one of only two wineries to win two Best of Category awards, thanks to their 2007 Riesling and 2007 Tranquility, which both took home top honors. The 2007 Riesling won for best Riesling and also for Best of Show, while the 2007 Tranquility won for best White Vinifera Blend. George Chelf, winemaker for Newport Vineyards, is proud of the accomplishments. "To take Best of Show out of 458 entries is a milestone achievement for Rhode Island wines," he explained. "Especially against some of the best wines in the country." The awards will lead to much more publicity for Newport Vineyards and their best wines - both the Riesling and the Tranquility will make their way to Washington, DC, for the U.S.
Congressional Wine Caucus in September, where they will be included at an awards presentation and wine tasting reception. Additionally, they will be poured at the "Taste of the Best of the Atlantic Seaboard" at the American Center for Wine, Food and the Arts in Napa Valley later this year. "Locally grown wine, just like locally grown food, has a lower carbon footprint than wines from the West Coast and imported wine," explained John Nunes, co-owner of Newport Vineyards. "Sales remain strong and we expect steady growth in the future." The growth of the vineyard is already well underway, however; the vineyard recently completed a 7500 vine expansion, making them the largest winegrower in New England, with a vineyard that reaches 60 acres. Planted on Nunes Farm, the new vines are growing on land that has been within the Nunes family for over five generations. Protected by the Aquidneck Land Trust, the varietals include Riesling, Pinot Gris, and Vidal Blanc. Production from the new vineyard is expected in 2011. 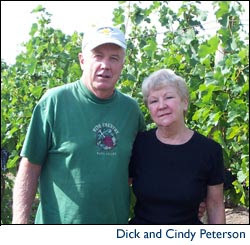 Newport Vineyards has been owned by John and Paul Nunes since 1995. The family farmland dates back to 1917 on Aquidneck Island. Through partnerships with the Aquidneck Land Trust, Newport Vineyards has acquired several properties and farms that are now protected from real estate development and must remain as agricultural. The winery is located at 909 East Maid Road in Middletown. It is open year-round for wine tastings and winery tours. Richmond, VA (Vocus/PRWEB ) August 6, 2008 -- The Virginia Tourism Corporation today launched the "Find the One You Love" sweepstakes to celebrate the 20th anniversary of Virginia Wine Month. Travelers passionate about wine can go to www.Virginia.org/wine and enter to win a trip to Virginia during Wine Month in October. One winner and a guest will be treated to a tour and tasting at Williamsburg Winery, sample from 30 Virginia wines featured at the Town Point Wine Festival in Norfolk, and set sail on a six-night cruise launching from the Half Moon Cruise and Celebration Center in Norfolk. October marks the 20th anniversary of Virginia Wine Month. Virginia invites travelers to "Find the One You Love" this October among the more than 130 wineries and 60 special wine-related events throughout the month. October is the perfect time of year to celebrate as the wine harvest and 15 million acres of fall foliage are at their peak. Virginia Wine Month began in 1988 as a way to support the state's young wine business - just 40 wineries at the time - and promote wine travel in Virginia. Twenty years later, passions for wine have never been higher and Virginia's reputation as a world-class wine destination continues to grow. Virginia offers something for everyone during Wine Month. A multitude of fine wineries located throughout the state provide visitors with one-of-a-kind wine experiences based on individual interests. Wine lovers and adventure seekers can travel along the state's many wine trails that trace themes such as the history of Thomas Jefferson along the Monticello Wine Trail to beauty of the mountains along the Blue Ridge WineWay. Families and friends can build a weekend trip around Wine Month festivals that combine great wine with music, history and more. Events like the Town Point Wine Festival in downtown Norfolk, Mount Vernon's Fall Wine Festival and Sunset Tour and the Norton and Bluegrass Festival at Chrysalis Vineyards in Northern Virginia are just a taste of what Wine Month has to offer. Visit www.Virginia.org/wine to enter the "Find the One You Love" Wine Month sweepstakes and plan a visit to Find the One You Love among Virginia's popular winery destinations. Or call 1-800-932-5827 to request a free, Live Passionately - Virginia is for Lovers travel guide. The East End’s lobster-claw shape evokes thoughts of dockside eating and the chilled dry whites that wash down oysters, clams, scallops, mussels and all sorts of white-fleshed fish hauled up from surrounding waters. If Raphael’s 2007 sauvignon blanc ($22), tinged with sémillon, were served unidentified in Montauk, it could be confused with one of the bracing white Graves poured in seafood restaurants along the Gironde estuary in Bordeaux. Enlivened by a slight spritz, Raphael’s bracing, light-bodied white wine, citric and almost saline, could qualify as an entry in one of the major contests matching wines to oysters on America’s East and West Coasts. So could Raphael’s 2007 clean, bright, palate-cleansing chardonnay ($16). The winemaker, Richard Olsen-Harbich, wisely produced it only in steel vessels, which preserve acidity and fruitiness. This light, balanced, appetite-quickening chardonnay, tasting of green apples and limes, could add dimension to cod or poached halibut in butter sauce. I would be happy to see the last of Long Island’s heavy California-style chardonnays that have been reared in brand-new oak barrels, whose intrusive woody, spicy, vanilla flavors neutralize the delicacy of saltwater dishes. Most rosés are intended as frivolous wines to be knocked back under the late-afternoon sun. But Mr. Olsen-Harbich, whose gravitas is evident to those who have tracked his long career, made a 2007 rosé ($15) that is, well, seriously frivolous. 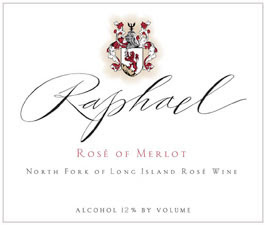 This delicate, savory mouth-filling salmon-pink rosé exploits merlot, the signature wine of Raphael, in Peconic. A small infusion of malbec gives it depth. Like the sauvignon and chardonnay, it was reared in steel, so its pizazz remains intact. Customarily, red wine — merlot, for instance — best accompanies a tuna steak. Raphael’s rosé can play this role in hot weather. It's an end and a new beginning for a trusty, bimonthly wine magazine called Wine East. Wines & Vines magazine announced last week that the content of Wine East will roll into a new special Eastern section of the monthly magazine beginning in September. It's a win-win for the two publications: The burden for just two people, along with contributing editors, to produce Wine East will be eased, and winemaking east of the Rockies will finally be recognized on a regular basis in a major monthly wine magazine. The July-August issue of Wine East is the last, and caps a long run: Since its first issue in May 1981, Wine East has published scholarly articles on everything from winemaking, viticulture and research to profiles of wineries. "Change is inevitable in everyone's life, and it is happening in ours," said Wine East editors Hudson Cattell and Linda Jones McKee in a letter to friends. With Cattell in his 70s and Jones McKee entering the Social Security age bracket, they were feeling the stress of the workload, which also included production, advertising and circulation. Now, with those duties in other hands, Cattell might even have time to finish his long-awaited book on the history of the Eastern wine industry since Prohibition. 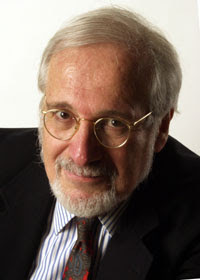 PHOTO: John P. HerrSan Rafael, Calif. -- Wine East, the wine industry magazine covering Eastern North America, is joining forces with Wines & Vines magazine, bringing better and more frequent coverage of eastern grapegrowing and winemaking to the pages of the broader-based publication. Beginning with the September issue of Wines & Vines, Hudson Cattell and Linda Jones McKee, the editors and owners of Wine East who founded the magazine 27 years ago, will provide wine industry editorial content exclusively to Wines & Vines. Wine East subscribers accustomed to receiving bi-monthly issues of Wine East now will get news and industry information twice as often, when the insert appears in the monthly issues of Wines & Vines. Wine East advertisers will reach the same Wine East readers as before, in addition to accessing readers to Wines & Vines. The transition of Wine East from a stand-alone publication to a monthly insert will allow Cattell and Jones McKee to continue providing relevant information to eastern grapegrowers and vintners, while relieving the two founders of many administrative and circulation duties. "The partnership with Wine East brings to bear the seasoned talents of Hudson Cattell and Linda Jones McKee on stories and trends that are especially relevant to the eastern region. 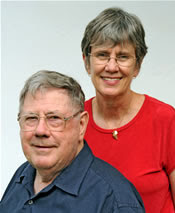 It's great to have them on our team, said Jim Gordon, editor of Wines & Vines. "At the same time, the eastern readers will get a broader view of their profession from the extensive coverage of industry-wide issues that Wines & Vines continually covers." The explosive growth of North American wineries in recent years--more than 6,000 bonded and virtual wineries are listed in the Wines & Vines print/online directory--has encouraged Wines & Vines to increase its coverage of issues relevant to the wine industry in the central, northwestern and eastern regions of North America, as well as California. "Industry members in each region have their own challenges and need their own solutions," said Chet Klingensmith, publisher of Wines & Vines. Why go through all the hassle of airport security and then settle for airplane food when many of the luxuries of a European vacation can be enjoyed in and around Litchfield County? Quality hotels, great food and phenomenal wines are just a scenic drive away, and as Gov. M. Jodi Rell says in her "Staycation" commercials, "less miles, more smiles, more fun." The Litchfield Hills are filled with fun summer activities that are not just for children. For those wine connoisseurs out there who had dreams of sipping wine in a fabulous European cafe this summer, but the rise in fuel prices quickly nixed that agenda, the same experience can be enjoyed locally. To satisfy the feeling of being away, Connecticut boasts 24 vineyards on the statewide wine trail and 11 of them are right here in Litchfield County. The lushness and views from these vineyards are reminiscent of faraway places with no passport required. Well, a certain type of passport is required to fully enjoy what the local vineyards have to offer. The Connecticut Farm Wine Development Council has created a Connecticut Wine Trail's Passport Program-a handy booklet with a page of information for each of the 24 vineyards-and lucky participants will receive their European fix. According to the program, vineyard visitors who have their passport stamped at 14 of the 24 stops by Nov. 7 will be entered in a drawing for valuable prizes, and two lucky winners will enjoy a 13-night stay for two at the Benaldaena Palace, a four-star property in Spain, complete with indoor and outdoor pools, a fitness center, spa and restaurant with views overlooking the Mediterranean Sea. The prize includes one-room, double occupancy, and room tax. Round-trip airfare for two people to Spain is provided by the Connecticut Farm Wine Development Council. Transportation to and from the airport is not included in the package. Winners of the two top prizes must take the trip between Feb. 1 to 14, 2009 and Feb.15 to 28, 2009. In addition to the two big winners, 15 closer-to-home weekend getaways for two will be awarded at the Courtyard by Marriott in Norwich.